Last night, Sam and I went to our friends house for a farewell BBQ for our friend Josh. We decided to ride our bikes! I love my bike, it was my christmas present from Sam. I put new grips on and the basket too. I just need to find a nice seat, I'm not really a hot pink kinda gal! Josh is off to see his amazing girlfriend, Roisin. They met in Ireland and spent three days together before he had to come back to Australia. Roisin came out 6 months later, and lived here for a year. We had some great times with her while she was here. I miss her so much! 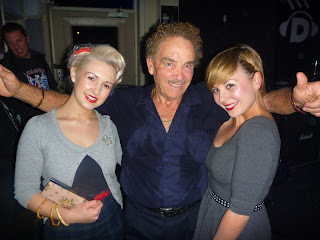 We thought this man looked like Gerry Stiller...he was creepy and smelt a little, but we had to get a photo! Tomorrow, Sam and I are doing a photo shoot at a friends house...hopefully we get some good photos I can share!